Supplementary material reads: "Captions from Gershon. 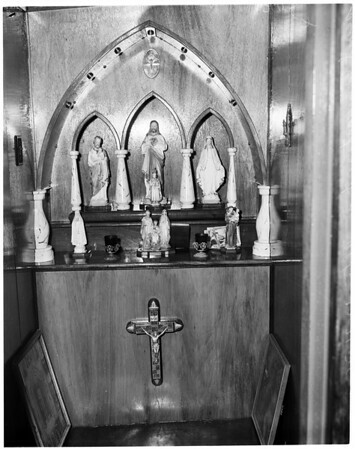 3 pictures showing Lewis Browne examining undeclared materials -- materials on floor were found under the fathometer -- stuff on table at left was found under the altar. There are 2 pix. of Manuel Luz -- one pix. of altar b4 opening the secret compt. and pix afterwards”.